As manager Andy Green would fill out the lineup throughout the 2017 season, he sure filled out a lot of different names. There were many players at a lot of different positions in the infield. 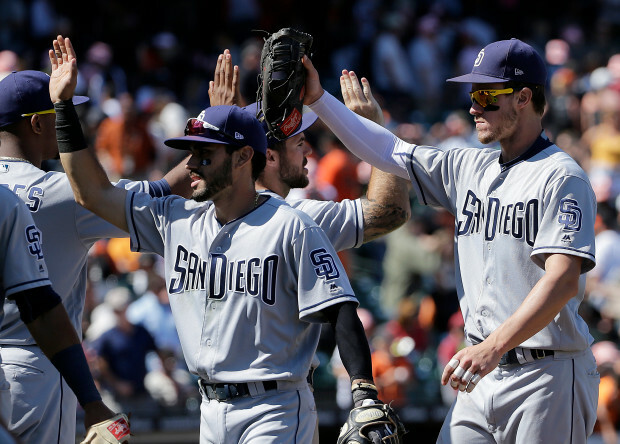 The opening day lineup consisted of Wil Myers at first base, Yangervis Solarte at second base, Erick Aybar at shortstop, and Ryan Schimpf at third base. The Padres had 14 different players play in the infield in 2017. Others who manned an infield position for the Padres in 2017 include: Allen Cordoba, Dusty Coleman, Chase d’Arnaud, Jose Pirela, Luis Sardinas, and Hector Sanchez. Lets now get into player performances and grades. Myers came under a lot of criticism from Padres fans throughout 2017 for “under-performing”. In his defense, he signed the largest contract in San Diego Padres history in terms of money. That being said, his expectations may have been set a little too high. Did Myers perform up to his full potential in 2017? My guess, and Myers’ response, would be “No”. Wil Myers posted a .243/.328/.792 slash line in 2017. He hit a career-high 30 home runs, while also having 74 RBI and 20 stolen bases. It’s safe to say Myers fell a little short of his 40/40-goal season in terms of home runs and stolen bases. The biggest downfall in Myers’ 2017 campaign was his 180 strikeouts. In terms of fielding, Myers was slightly better than league average, posting a 9.23 range factor per nine innings. The league average was 8.94. Myers was below average at first base, posting -3 in zone total fielding runs, while posting one run above league average in defensive runs saved. Myers wasn’t terrible in 2017, and was debatably the Padres’ most productive hitter. Myers was actually just the 3rd Padre in history to have a season with 30 home runs and 20 stolen bases. Steve Finley and Ryan Klesko were the others. 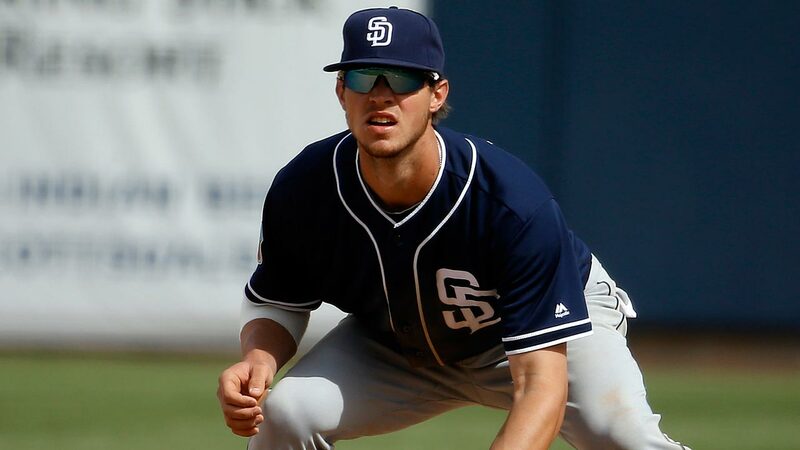 Going forward, Wil Myers certainly still has room to improve. Naylor hit collectively .280, with 10 home runs and 64 RBI across High-A ball, and Double-A. Naylor is only 20 years old, but has shown an advanced ability to recognize pitches and make contact as a power hitter. Josh Naylor could debut in the major leagues by the end of the 2019 season. Asuaje was called up June 23, and became basically the everyday second baseman from then on. Asuaje was very impressive in 2017 with the bat and with the glove. He posted a .270/.334/.696 slash line in 2017. The most impressive takeaway from Asuaje was his patience in the batter’s box. He exemplified the ability to work a count and foul balls off. Many times throughout the year, Asuaje was a frustrating out for pitchers. 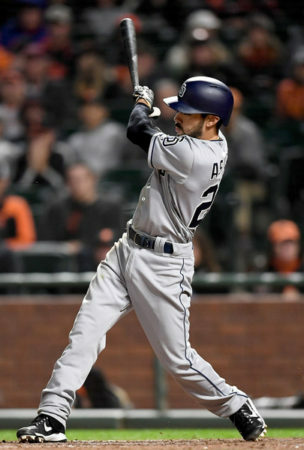 Asuaje was a solid defensive second baseman for the Padres in 2017, with only three errors. Asuaje also had a 4.77 range factor/9 innings as a second baseman, good enough for fourth-best in the National League. He also posted five total zone runs, good enough for third in the N.L. The only downside to Asuaje is that he offers very minimal pop from the bat. He still produced a 0.7 oWAR, but hit only four home runs and slugged just .362. As a second baseman, having minimal power isn’t out of the norm, but Asuaje will likely be a reserve utility player in the coming years for the Padres. For his rookie season, it is safe to say Asuaje exceeded expectations. The rookie exemplified consistency as an everyday starter, which earns him a good grade for the 2017 season.